Configure "TeamForge Associations" to notify TeamForge EventQ about work item activities. Find the TeamForge project to associate with and enter its url in the Project Home URL field. 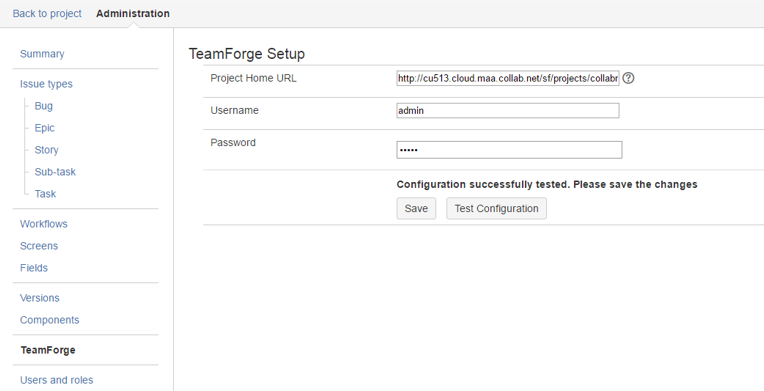 Obtain the TeamForge Project Home URL by navigating to the target TeamForge project and clicking Project Home. Copy the URL from the browser. Using your valid TeamForge login credentials, click Test Configuration. The user whose credentials are supplied must have API permissions in both TeamForge and EventQ, or is a Project Admin. Test the current configuration by clicking Test Configuration. The system indicates whether the supplied URL and credentials work properly. Click Test Configuration to verify that the supplied user has adequate permissions in the selected TeamForge project.